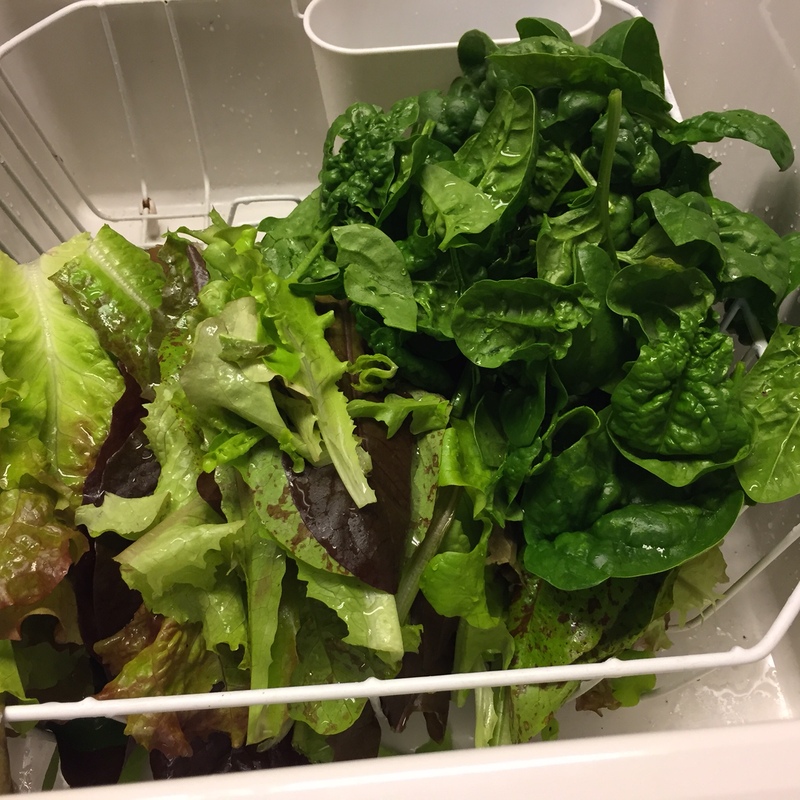 I am amazed that I am still getting lettuce from my little garden in my yard! I was able to make salad a couple of times this week, and there’s still more out there. It’s been unseasonably warm here, but we are now past our usual frost date, so this won’t go on forever. I’m hoping to go pick some more today. This past week, I was able to concentrate on getting some things done around my home. Friday was a holiday for both the kids and Rob, so I did not need to do school with the girls. Instead, I cleaned a lot, weeded in the yard a bit and unpacked a few more bins. I also pruned the blueberry bushes and Lovana cleaned up the rhubarb plants. I have not pruned blueberries very often, so I just trimmed off any dead wood and cut them back slightly, being careful to open them up a little in the middle and cut off any straggly branches, but I left as many of the new little buds as I could to hopefully make blueberries next summer. I got some great deals at Fred Meyers over the weekend–apple juice for 99c/container (I bought 10), Life Cereal for $1.49/box, 2 chickens for 88c/lb, and potatoes for 88c for 10lbs (I got 5). I still have some potatoes left from the garden this summer, but this is a potato-loving family and we are burning through them. Lovana especially loves them and eats them almost every day. I put them in the shop so they will stay cool and last longer. I have been working on using up food-storage items that I’ve had for a while, but also have been working on building things back up when I find a great deal. I keep pretty good track of things and like to rotate them often. I was especially glad to get the apple juice as it is a favorite of the kids, both mine and my nieces and nephew, so we will drink that quickly. I could have used 20, but am glad for the 10 I chose to buy. The cart was certainly heavy enough with all those potatoes, 10 juices and other things I bought–so I called it good! I love being well-stocked. I couldn’t have made it through the last year as nicely without such a well-stocked pantry, freezers and garden. There were many, many weeks where we spent only $50 on groceries, and ate very well. It’s great to have the chance to fill it back up. I was also able to get a few items for Christmas gifts from the 70% off the lowest marked price clearance section. I have some plans for the girls that are well on their way now. We got the camper moved down here and parked. It is so nice to have it here. I hope to get in there and do some cleaning before too long–it could use a thorough going-over after living in it for 3 months, and the dust that accumulated in it since then is significant. I’m also excited since there are items in there that I’ve been missing, and a bunch of food that it would be good to just use up. We plan to make some reservations and go camping in the next few months–living in it did not dampen our enthusiasm in the slightest. We can’t wait to go! You got some good deals at the store. Glad you were able to catch up on a few things at home. Our family loves potatoes as well. There are so many ways to fix them. Hope you get to squeeze in another camping trip soon. Camping can be work, but it’s also relaxing as well. I enjoy reading your blog. …Vicky in Ky. Thank you, Vicky. I was just thinking this morning that we had not made those camping reservations, yet. Better get on it or it will just be wishful thinking!!! It’s great that you have green tomatoes ripening. Last year, I was able to do that,and hope to do it next year, once I get a really good garden going. Sewing is really fun for me as well, although I’m struggling to carve out time for it so far–a good goal to work towards. I’m glad your daughter can be closer. I’m sure it’s absolutely wonderful after her being far away for a long time! Enjoy those children!! We got that killing frost here and I was sad to see the end of my green onions. I have been enjoying being able to harvest them fresh from the garden for so long. You did really well on those deals at the grocery store! I’m with your daughter, I love potatoes and so does my hubby but we have to limit them for him since he is prediabetic. I peeked out this morning and the lettuce is still standing!! Incredible! This is so much later than usual. Of course, I need to remind myself that I am quite a bit lower in elevation than I was last year—-still, I wonder that the little fall garden is still standing:) Hopefully, I can pick more lettuce today–we ate what was picked the other day, and obviously we are on borrowed time.